Each week in 2015, ManMade is sharing our picks for the essential tools we think every creative guy and DIYer needs. We've selected useful, long-lasting tools to help you accomplish a variety of projects, solve problems, and live a hands on lifestyle that allows you to interact with and make the things you use every day. Love the thought of making useful and beautiful pieces out of leather? Here are the first few steps to get started down the path of making your own essential carry pieces and everyday items from that timeless and durable material. I've always loved the feel of leather. It's strong and longlasting, but still has the supple texture of natural materials. And my favorite part, it ages well. I love to look at pieces I own and feel the years and experiences that softly made their mark on my life. As a maker, leatherwork is one area that I hadn't done much with, mostly because I just didn't know where to start. But I've been embracing the craft, and put together a getting-started sized tool kit that'll have you turning out goods in no time. Essential Tools: As with any pursuit, the tools can make the process faster and more precise, and greatly impact the final product. But don't think that skill can't be built with the basics. Start with a small set of the essential tools, and move up to better, more specialized pieces as the need arises. This is the best way to avoid spending money on tools that you never use. 1. Knife - A sharp and precise knife is important for accurately slicing those pieces to size. Have a medium #2 X-Acto knife for the small cuts, and a larger moredurable break-away razor utility knife for more comfortable cutting on the bulk of the pattern. 2. 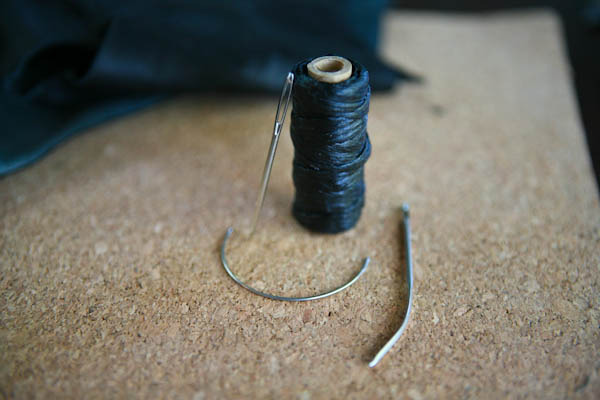 Needles and Thread - The needles used for leather stitching are large, with a triangle shape to push easily through the animal skin, and have a large opening to accommodate thick thread. Thread comes in such a variety, it's hard to know where to start, but get a medium strength Waxed Black and Brown for some variety. 3. 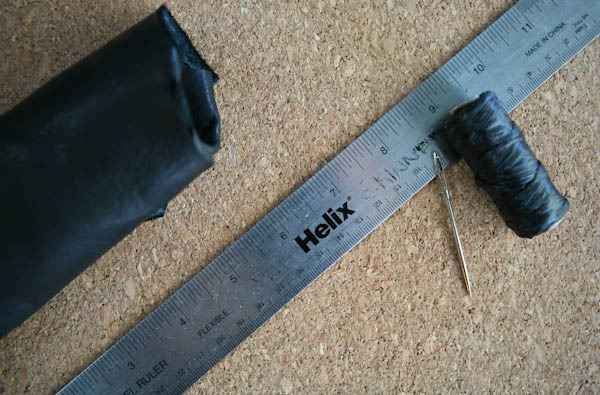 Hole Punch - This is a must to cleanly cut holes of different sizes in the leather. Bump up in quality a bit here for less hand fatigue and cleaner holes. Also in this category is the flat chisel. This tool punches small holes in a line for stitching, ensuring evenly spaced holes for a clean finished look. Get a set to make the punching go faster but also be precise in the corners. 4. Work Surface - A clean, flat, and forgiving surface is great to make sure everything laysout right. Cork is a soft, grippy, and natural surface that works great, but can get torn up rather easily. 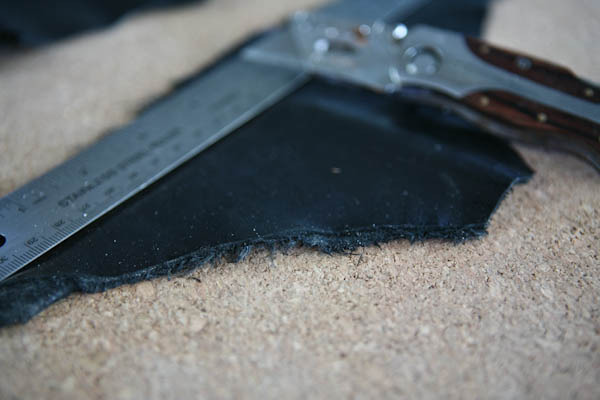 If your workspace is used for more then just leather work, go for a pvc cutting pad so you can move and store it easily. Not as soft or grippy, but it is self healing and will survive some abuse. 5. Leather - Getting the actual materials can be a bit daunting. How do you know what you want and how much of it? Start with enough for a small project like a book cover, which is about 1-2 sqft with plenty of leftover scraps. Pick cow hide to start as it is soft enough but still has plenty of structure. Did you find this list helpful? Did I miss anything? We'd love to hear from you on what tools you think are indispensable when getting started. We'll be making a few started leather pieces in the next few weeks, so stay tuned for great ways to use your new starter set! Hi @Critifur! Thanks for the tip, you're right a sharp knife is huge when cutting. Also, thanks for the tip on getting used leather from jackets, I might head down to my local shop around here and check that out! Everyone knows the best knife is a sharp knife, which goes for all cutting tools. While I love the ease of switching out of X-Acto blades and breaking off the blade of a utility knife when they get dull, I love making those blades last even longer... I added a blade sharpener to my kit. The Kershaw Ultra-Tek Blade Sharpener with 600-Grit Diamond Coated Oval Shaft works great, and I end up not having to change my blades that often. One tip that I have for those starting out is to avoid the kits that you might find in a hobby store (with the exception of stamps and punches). Many of the tools are a lot cheaper purchased at the hardware store. It is also a really great idea to search auction websites and garage sells for old vintage tools. They have such great character and were built to last. Just my two cents.